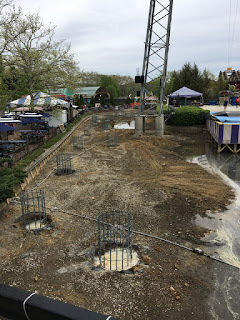 Something is Coming to Kennywood in 2019, But What? While it's been speculated for some time that Kennywood would begetting something huge, here's the first step to that being true. While we don't expect it to be North America's largest wooden coaster as some news outlets have written about, we do expect it be major. The teasing begins on Kennywood's Instagram Page. As expected, this project is taking place in the former Log Jammer site, which the park shut down last season. Photo by Screamscape showing large footers being out into place. The cbslocal.com article mentioned above goes on to talk about a wooden coaster for this plot of land, but these footers do not look to be for wooden supports. We'll just have to wait and see.